ZAMBOANGA CITY (Mindanao Examiner / Oct. 3, 2011) – Kidnappers freed a kidnapped US woman, but held onto her son and a relative in the southern Philippine province of Basilan, officials said Monday. Officials said Gerfa Yeats Lunsmann, 42, was freed in the town of Maluso late Sunday and brought to a military base in Zamboanga City and is now in the custody of the Federal Bureau of Investigation and US troops. “Kidnapped victim was brought by an unidentified man wearing a ski mask onboard a motorized pump boat to the Maluso wharf and let the victim walk towards the village. Her son Kevin is still being held captive,” said Army Lieutenant Colonel Randolph Cabangbang, a spokesman for the Western Mindanao Command. Filipino gunmen kidnapped Lunsmann and son Kevin Eric, 14, and a relative Romnick Jakaria, 19, on July 12 while vacationing in Zamboanga City in Mindanao Island. 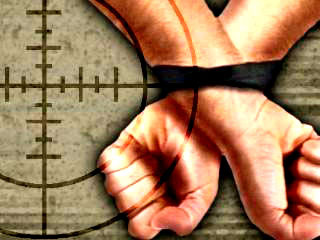 Local officials said the gang has contacted the woman’s husband in Virginia and demanded ransoms for their safe release. Media have reported that the kidnappers demanded $10 million ransoms, but this could not be immediately confirmed. It was unknown whether Lunsmann’s family paid ransom for her freedom, or whether she was released by the Abu Sayyaf to raise ransom for her son’s safe release. Gerfa was born in the Philippines and moved to the United States when she was nine years old after an American family adopted her.